Over three weeks of SERVE, Catholic Charities’ Volunteer Services worked with 44 area high school students for a total of 1,069.5 hours at CCANO’s Greenwalt Adult Day Health Care Center, Ozanam Inn and Second Harvest Food Bank. 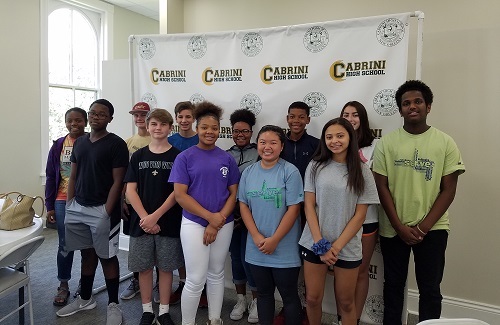 Some participants also participated in a Day of Reflection at Cabrini High School where they discussed issues of social justice, Catholic Social Teaching and what they learned from their volunteer experiences. Learn more about SERVE and CCANO’s other youth volunteering opportunities. Sydnie Bowman, a single parent, enrolled her daughter Journie in our Incarnate Word Early Head Start program in 2015. She then transitioned into Head Start and excelled over the next two years. Journie has now completed the Head Start program and is a smart, talented kindergartener! During Journie’s time at Incarnate Word, Sydnie was working towards a Bachelor’s Degree in Psychology at Southern University while also serving in the Army Reserve. In May of 2018, she received her degree. Now, Sydnie will begin graduate school to work towards a Master’s Degree in Social Work. Staff at Incarnate Word admire Sydnie for her outgoing personality and unwavering motivation. She regularly shares the educational, health, social and other benefits of Head Start with those in her community and is grateful for the support she received as a parent. Learn more about our Head Start and Early Head Start programs. September will mark the beginning of the annual Archbishop Hannan Community Appeal (AHCA) campaign. Now in its 53rd year, the AHCA mobilizes the community to raise much-needed unrestricted funds. Launched by Archbishop Hannan in the wake of Hurricane Betsy and in response to the overwhelming needs of our community’s poor and homeless, today the campaign underwrites all 29 life-giving programs of Catholic Charities. Unrestricted funding allows Catholic Charities to respond quickly, effectively and compassionately in times of crisis and disaster as well as to fill gaps where economic issues force governments to cut support for social service programs. This year, the 2018 AHCA campaign aims to raise $1.85M to serve the men, women, children and families in need in our community. Donate Today! 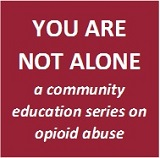 The Counseling Solutions program of Catholic Charities Archdiocese of New Orleans is collaborating with the Substance Addiction Ministry of the Archdiocese of New Orleans to present a series of community education forums on opioid abuse. The next forum is September 25 from 6 to 8 PM at Mary Queen of Peace Parish Center. Learn more about this event.